iTunes library contains files that you added to your iTunes. It’s used by iTunes to organize, store, and manage music and other media files added to iTunes. Hence, iTunes library is useful to Apple users when they want to store, manage, organize and access iTunes media files and information such as playlists, play counts, song ratings. Storing or backing up your iTunes library and playlists in a hard drive provides extra protection for your files. Most users who understand how unreliable iTunes can be, would make extra effort to save an extra copy of the iTunes library and playlists on an external hard drive. However, before you can transfer iTunes library and playlists from your PC to hard drive, you’ll need to locate your iTunes library. 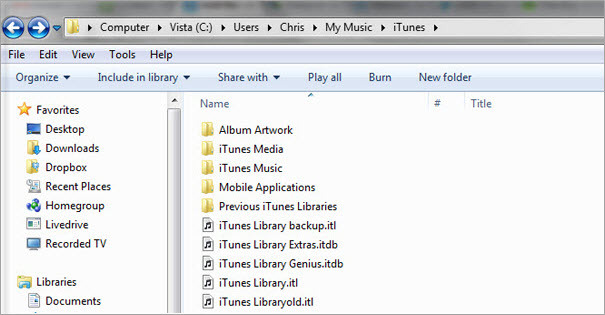 Locate iTunes Media folder on your Windows computer by clicking Users > Username > My Music > iTunes. Step 1Connect your hard drive to your Windows PC’s USB Port, and open the hard drive on your PC. Step 2Locate and drag the iTunes Library and playlists folder, and drop it on the external hard drive now showing on your File Explorer. After backing up your iTunes library on your hard drive, you can now disconnect it from your PC for safe keeping. Home sharing is a good way to move your iTunes library and playlists from one computer to another. When you use Home Sharing network to download media files from iTunes Store, the files will automatically sync to all the computers on your Home Sharing network. Step 1On the interface of iTunes, turn on Home Sharing by clicking File > Home Sharing > Turn on Home Sharing. Type your Apple ID and Password, then click Turn on Home Sharing. Step 2From your Mac, choose a computer on your Home Sharing network where you want to import files from. Step 3Choose a category (e.g. Music, Photos, etc.). Step 4Choose "Items not in my library" from the menu appearing on your iTunes windows. Step 5Select items you would like to import and click "Import". iMyFone TunesMate is an iPhone, iPad or iPod touch transfer tool that can be used to transfer iTunes library and playlists. 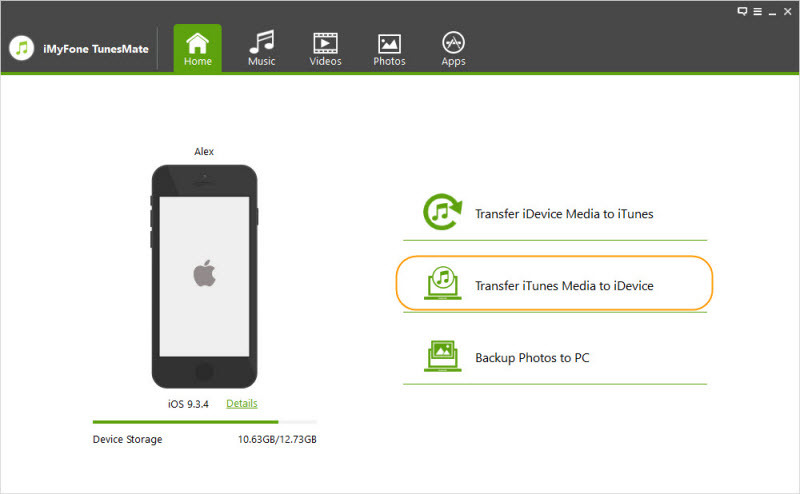 It has the capacity to transfer all types of files between iPhone and computer/iTunes. It can sync iTunes library and playlists without losing any data, rebuild previously damaged or corrupted iTunes library, and transfer various kinds of media files such as music, playlists, podcasts, audiobooks, etc. Compatible with iOS devices running iOS 7.0 and later, iMyFone TunesMate can export your iTunes library and playlists in just several mouse clicks. 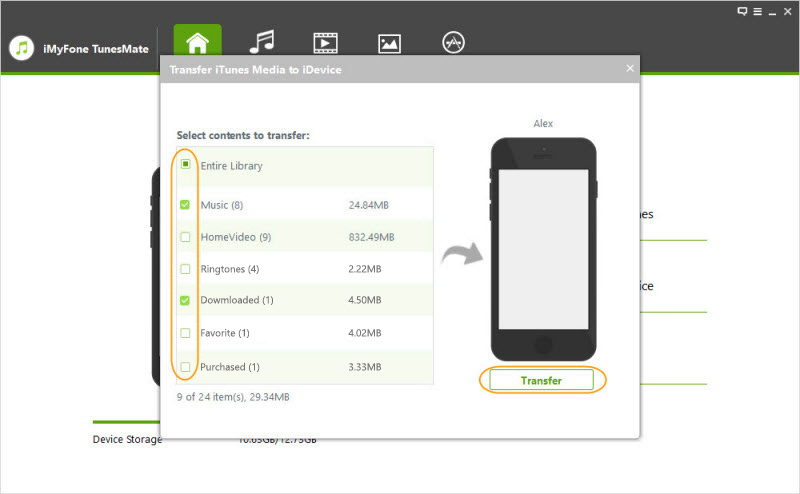 Two-way free transfer: not only export iTunes library and playlists to iPhone/iPad/iPod, but also transfer iOS data from iPhone/iPad/iPod to iTunes or computer. Seamless syncing: sync iTunes library to iPhone without covering the existing files on iPhone, losing the existing files on iPhone, or destroying your media playlists or library. Rebuild damaged iTunes library in 1-click:helps to rebuild damaged iTunes libraries and playlists. Bypasses iTunes limitations: All annoying iTunes limitations such as 5-device support, 5-computer authorizatio, transfer errors, etc. can never be experienced with TunesMate. As is mentioned previously, we can use iMyFone TunesMate to transfer iTunes library and playlists for backup. Below is the step-by-step guide. 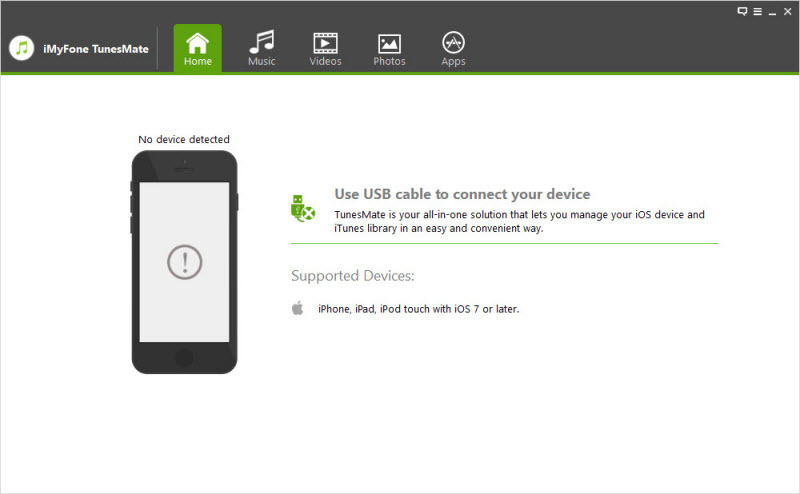 Step 1Connect your iOS device, be it iPhone, iPad or iPod touch, to your computer where iMyFone TunesMate is installed and launched. Step 2On the home interface of iMyFone TunesMate, click "Transfer iTunes Media to iDevice" to scan your iTunes library. Step 3By default, all iTunes media files are checked. Uncheck those you don't want to back up, and click "Transfer". Step 4It will take a while to complete the transfer process. You need to click "OK" button to conclude the process. You now have your iTunes library and playlists backed up. Just enjoy your iTunes media files elsewhere with great fun!